Located at the corner of the Research Dr and Muller, Extra Space Storage serves Irvine residents near Irvine Spectrum Center, Quail Hill, Lake Forest, and Laguna Woods. Locals will recognize our facility south of AutoNation Toyota Irvine near CarMax. 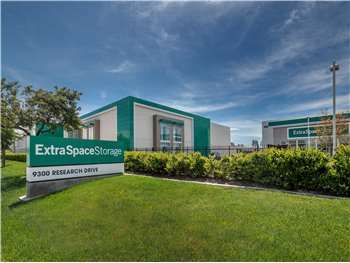 With a wide range of storage units, climate-controlled storage, drive-up access, and exceptional security, Extra Space Storage on Research Dr is the self storage partner for you in Irvine! Our Irvine storage facility has unit sizes from 5x5 to 10x30 and unit features like first-floor access, elevator access, and drive-up access. We can accommodate residential and commercial storage needs alike! Extra Space Storage is equipped with security measures like 24-hour video surveillance, security access to your floor only, electronic gate access, and individually-alarmed units. Protect sensitive items from extreme heat year-round in a climate-controlled unit. These units stay between 55? and 80?, preventing damage to your belongings. Save time and energy with drive-up access. This amenity allows you to pull a vehicle right up to your unit unload and load items. Drive-up units can also be used as a garage-like space for cars, motorcycles, and other small vehicles. At Extra Space Storage, we believe our customers deserve the best. That's why we provide high-quality self storage in a clean, secure, well-maintained facility. It's also why our friendly, professional staff goes above and beyond to deliver incredible service. Contact us today to reserve a storage unit in Irvine! Have used Extra Space at 2 locations for 2 years. Great staff as our needs have changed. We have rented 9 lockers over the 2 years. The staff was through, polite and efficient. Price and cleanliness is top of the line! I would highly recommended Extra Space Storage in Irvine, Ca. I've used several other storage facilities over the years, and Extra Space Storage is the cleanest and most professional. Their prices were also very competitive. My experience with Extra Storage was great. Staff are very helpful, pleasant and efficient. Facility is very clean and well maintained. The BEST storage facility- great friendly staff that's very knowledgable and helpful. Super clean new very secure facility in Irvine. Wouldn't go anywhere else! The staff is very helpful and goes beyond what they have to do. The facility is very clean and easily accessible. Easy freeway access on and off. From I-5N or I-405N exit Bake Pkwy (94A), turn right, left on Research, facility will be on the right.